The virtual vault of knowledge that is Wikipedia has as today’s featured article the subject of Redshift. In physics and astronomy, redshift occurs when the visible light from an object is shifted towards the red end of the spectrum. More generally, redshift is defined as an increase in the wavelength of electromagnetic radiation received by a detector compared with the wavelength emitted by the source. 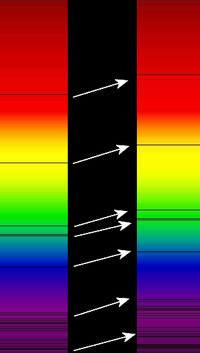 Any increase in wavelength is called “redshift” even if it occurs in electromagnetic radiation of non-optical wavelengths, such as gamma rays, x-rays and ultraviolet. The article goes on to explain Doppler shift, the math behind figuring out shifts, and more. It’s a vast dump of cool knowledge that sadly exceeds my capacity to understand.